We all want to raise naturally healthy kids. Part of that is a solid education, to equip them to succeed in life as adults. Recently, a New York school became concerned about the effect that homework assignments were having on their students. They created a task force made up of teachers and parents to look at what the studies about homework in the early years actually showed. They realized that studies showed no benefit to homework in these years. Plus, the school’s experience was that many children were missing recess because of homework that wasn’t turned in. It was clear to them that for their students (and for children in general), it was better to skip the homework. So, they changed their policy. They wrote parents a well-thought-out letter, explaining their reasons for the change (no more homework for any of their students, K through 5). Instead, they encouraged children to go out and play, talk to adults, and enjoy time with their families. Amazingly, instead of understanding the reasons and research the school had done and being grateful they didn’t need to force their children through homework every night, families were angry! Some are even trying to pull their children out of this school, and move them to other schools that offer homework! These parents have made an important mistake: believing that homework (usually busy work, worksheets) equals learning! Many of the parents quoted in the articles about this issue noted that they thought students “needed” homework in order to practice the skills they had learned in school that day, as well as to develop discipline. Remember that these are very young elementary schoolers. The thing is, when children are this young, they really do learn best by experiencing the world around them. They can’t help but learn basic math skills, reading skills, and even more. They learn by playing with others. They learn by looking at books or reading with their parents. They learn by playing games. They are learning all the time! This is exactly what the school discovered through its research into the issue. And yet, when presented with this information, parents still insisted there was a clear benefit to homework! 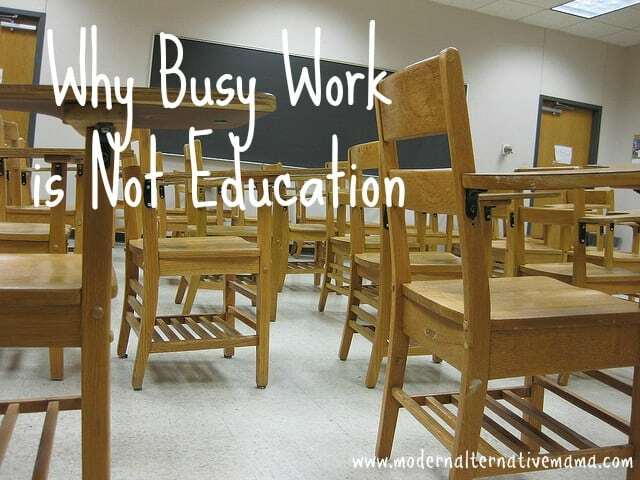 The thing is, so many people equate busy work with learning. In order to learn, they think, we have to do something that is specifically designed for education. Worksheets, reading assignments, writing papers, something that can be easily quantified, graded, measured. Only these things, deliberately chosen for learning, constitute education. We don’t only learn when we sit down and plan to learn something. We are learning all the time. We can’t stop learning. When we cook a new recipe and learn a new technique, we learn something. When we fail at that new recipe and realize our mistake, we learn something. When we interact with someone different from us and converse with them, we learn something. There are so many opportunities for learning absolutely everywhere. Sitting down and doing worksheets, especially on things we already understand, is not valuable. (Homework and practice on new skills at older ages, when information requires more focus to actually master, is valuable. This is not railing against all homework ever.) We don’t learn just because we are “doing activities.” Activities must have some kind of intrinsic value — kids must enjoy them, participate in them actively, ask questions, explore new information, in order to learn something. Now, some parents suggested that it might be more beneficial to assign homework along the lines of reading time with adults, or hands-on science experiments, or just to send home a summary of the day’s activities with suggestions for games that children might play that would go along with it. And sure, these things would be much more valuable than your average worksheet. But they’re also more work for teachers — to come up with them, create sheets explaining them, etc. If parents are so concerned, they should take the initiative to involve their children in reading, games, etc. of their own volition. They don’t need a teacher to “assign” it to them. We feel like if we don’t have that structure, then learning isn’t really taking place. We feel lost without the objective measures. But here’s the truth: that’s all a construct. It’s all an education paradigm. It’s one way to learn (and not even the best way). There are many, many different ways to learn, and none are less valuable than school, and many are more so. Learning takes places all the time. Truly, it does. We do not need to engage in “formal education” to prove something, or to ensure real learning. How many of us went to public school and remember very little of what we “learned” there? I know I’m in that boat. I couldn’t even tell you what half of my classes in high school were supposed to be about, or any of the facts that I learned in them. I’m sure I remember some of it, but I don’t connect it with those classes. Classes do not matter. School does not matter. We learn through experience. We learn when we feel motivated to learn — not when we “have to” do work just to get a grade. And that’s really the whole point of this school dropping homework. Students were being forced to do work for the sake of getting a grade. It wasn’t helping them learn. They were getting punished when they didn’t do it. Their school experience, and possibly even their learning experience, was actually negative because of this situation. The school decided to remedy it by encouraging them to do activities that they want to do, which will help them actually learn. We should be encouraging our children to play. We should be encouraging them to learn life skills and basic “academic” skills in a hands-on way. (Those “who can count to 100 first” contests kids have are more valuable than rote drills in school!) We shouldn’t expect or demand that they have homework, or believe that this is the only way for education to happen. The world would truly be a better place if we all stopped equating school and busy work with learning! How do you feel about this school’s no-homework policy, and the idea of busy work = education? Love this post and couldn’t agree more! I have been home schooling for quite a while. Right now I have a tenth, eighth, fifth, fourth, and first grader. And a toddler running around. At the beginning of my home schooling career I tried to do “school” at home. After a few years of really not loving what we were doing I researched a bit and totally changed up my way of thinking and doing. Now we emphasize reading skills and math. The rest is really good books and the ability to pursue what interests them. They are lovely, interesting kiddos. It works. What is hot in our house at the moment is the human body and its functions, crocheting, botony, Monet painting, origami, and the reading! So much reading. Good job Kate with knowing this so early on for your kids sake. It definitely makes for a happier house! Definitely believe that busy work is not necessarily learning. It would be much better for kids to talk with their parents, read and discuss the books they read, and get outside to play after school! When I was home schooled, the only type of homework I was given was basic math and spelling, and we only did those during “teaching hours”. All other subjects, my mother made me pursue. If I found something I was interested in, I learned more about it. If I wanted to try something out, I did. I made mistakes and I learned. I have never learned more in any school setting than I did in that one short year being taught by my family as a whole. My children are in our public school and in grades 12,9 and 7.The amount of homework varies.Thankfully they have never felt overwhelmed with homework nor have I felt like they have been assigned too much.My senior is in all AP classes and concurrent classes through the University of Oklahoma.So there will obviously be homework. He is also an athlete. My 9th grader is also in AP classes and is an athlete.My 7th grader is in pre-AP classes and is also an athlete. Usually the homework is what doesn’t get finished in class. I absolutely think that teaching needs to be done in the classroom.That’s what school is for.We have been blessed with an amazing school system and we are very thankful!! I’m very aware that not all schools are like ours and we don’t ever take that for granted!